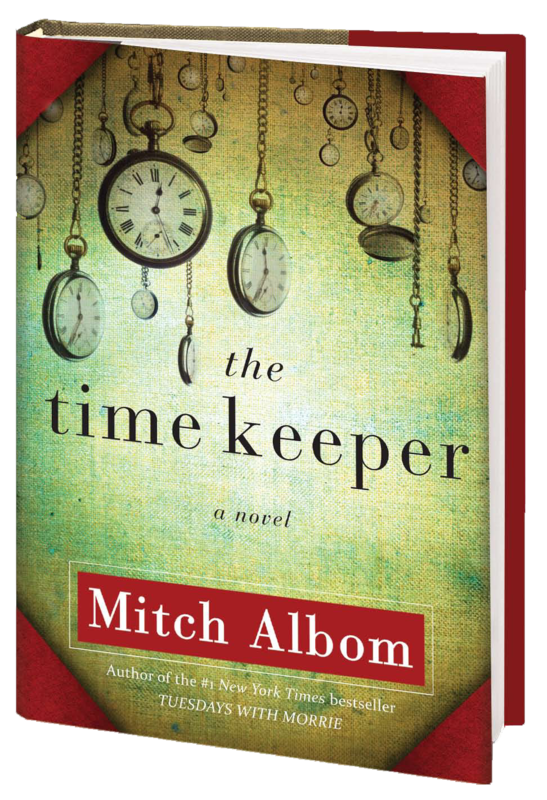 The Time Keeper – by Mitch Albom | brainsnorts inc.
Every generation has someone who is “different.” Not a Forrest Gump kind of different, but more like an Einstein, Copernicus, DaVinci, or Edison kind of different. Those people who gave up most of their own lives in order to do things to enhance everyone else’s lives. In a simple time, when life was all about catching fish and making tools and clothes from the trees and rocks found outside the village, Dor was different. Instead of sharpening his hunting skills, he paid attention to things around him. For example, sometimes there was one rock. Sometimes there were several. Sometimes the rocks amounted to the same as some of the fingers on his hands. He made sounds to match the number of rocks or other things that he had paid attention to in a way that was the predecessor to counting. He noticed other things, like the different shapes of the moon and how those shapes appeared in a certain pattern that was always the same. He noticed the sun and how it made a shadow. And he noticed that the shadow of a stick in the ground would move the same way every day, day after day. Dor also noticed that others did not seem as interested as he was about these things, but he didn’t mind so much except when he was asked by King Nim, the greatest king ever and also childhood friend, to either use his ways of being “different” to help him defeat the Gods or move away from Nim’s kingdom forever. Although Dor and his wife and other childhood friend Alli left their children behind and fled the kingdom, Dor did not stop being different and eventually lay the groundwork for creating the most bittersweet concept ever – counting time. Although that concept had not fully happened yet, God was neither waiting for the final product nor taking it lightly and banished Dor from earth. There’s a little more drama involving the whole banishing thing, but you don’t want me to take away all the excitement, right? In order for Dor to return to Earth, he must find and help two specific people who are also having issues with time. Although he knows neither of them, one is a Sarah Lemon, the excellent high school student we all wish to have, who has been publicly humiliated by someone she thinks is her boyfriend. The other is the 14th richest man in the world, Victor Delamonte, whose 85 fabulous (mostly) years on Earth were just not enough, and he finds a promising way to live forever. If Dor can teach these two a lesson about time, his banishment will end, and he’ll return to his Earthly place by his sick wife’s side. 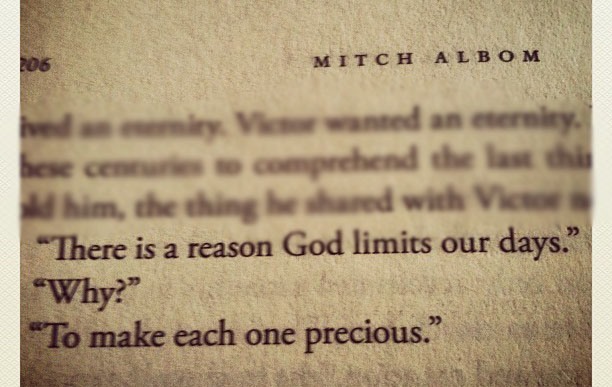 Mitch Albom is well known for writing about living, dying, and the blurry line that occasionally is drawn between, and that’s exactly where The Time Keeper spends most of its 239 pages. I’m not positive about the word count, and it seems short enough to be more of a novella than a novel, but that won’t affect the enjoyment. In fact, had the story been much longer, I would have accused Albom of dragging out the inevitable just to increase the word/page count. It ended when it needed to end. No sooner or later, a thought that’s echoed throughout the story. Albom’s casual style dances between the conversational and the formal, at times sounding like just two guys talking over a beer but other times a father instructing a son. It was such an easy and compelling story that I read it start-to-finish it in one day on a beach with a little time in the middle for lunch and several glasses of Malibu Rum and pineapple juice. Too many writers spend too much time on details – furniture in a room, physical details of a person, styles of cars, locations in a city, etc. Albom runs my way, keeping those things to a minimum because readers are easily capable of filling in blanks with their own preferences. Early in the book, we learn that Victor Delamonte is the 14th richest man in the world. Albom could have easily been sidetracked by including all the “stuff” that Delamonte’s wealth and years might have acquired, but we all know it’s not necessary. Readers are better off focusing on the story and not what’s in the store. I didn’t read the highly successful Tuesdays with Morrie because, from what I gathered, it seemed too “sappy,” and it was released at a bad time in terms of what was happening in my personal life that might have caused me to dislike it unfairly. Perhaps now that I’ve read and enjoyed The Time Keeper, I’ll check out that other book soon. This book was a gift and wasn’t a personal choice, but I trust the gift giver enough to know what I’d like to dislike, and she made a great choice. I was worried about the ending, and I’m still not sure if my worry was real. When God traps Dor in a cave as part of his “punishment” for trying to measure time, there’s no real mention of where the cave is actually located. At the end of the story, there’s a bit of a suggestion about it, and likely the location is then open to interpretation. My best interpretation slightly dampened my enjoyment of the story, but it’s possible I’m wrong. I actually hope I’m wrong. However, if you’ve read The Time Keeper, then I’d love to hear your interpretation. And if you haven’t yet read it, then I encourage you to do so. It’s a book we all need from time to time, something to remind us that those of us who spend too much time in front of the TV or retreating from others should make a better effort to put down the remote, turn off the phone, and just get up and do something worthy of the blink of time we all have on this great planet. For about 6,000 years, Dor is held captive as a cave unable to do anything except listen to the millions of cries from those who seek more “time.” This was sort of a punishment assigned because of how God feels that Dor sort of ruined mankind’s appreciation for life because of the new obsessions with time. To me, that was not just cruel but unfair. Dor did nothing more than use this “God-given” talent and powers of observation in order to pursue a device that would help the civilization of man to evolve. It was a Renaissance moment, ahead of its time but a highly significant event. I find it hard to accept that Dor deserved any punishment and perhaps should have been rewarded. It’s arguable, it’s an opinion, and I’m sticking with it. Once I accepted that, I was easily able to read and enjoy. Prometheus was punished severely for giving man fire (that part about the birds was pretty severe and unusual …) Good review. i’ll try to check out that book. thanks much much. quick read and good too. give it a shot. Thanks for the review. I will check into it. good. i think you’ll like it.